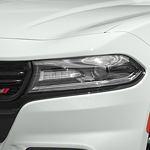 When you're searching for a mid-sized sedan to drive around Hinton, let Big Rock Chrysler Dodge Jeep Ram show you the new 2019 Dodge Charger. It's equipped with a wide variety of technological features to make driving easy, safe, and fun. The Dodge Charger comes with a Uconnect system that will allow you to connect either an Android or iPhone smartphone. You'll be able to use your phone to make hands-free phone calls or listen to music. The 7-inch digital cluster display will make sure you have all of the information you need to drive. For convenience, the Dodge Charger comes with a Keyless Enter 'N Go key fob. The doors will unlock automatically if you pull on the front door handle while you have your keys anywhere on your person. You'll also be able to start the car with the simple push of a button.